Place all the chocolate in a large bowl over a saucepan of water and bring to the boil, then remove from heat. Make sure the bowl isn’t in contact with the water. Stir occasionally to combine and prevent it from sticking. In a separate bowl, combine the rice bubbles & coconut. Next get a tray, rack or platter that will fit on a shelf of your fridge and lay out 16 patty pans - a baking tray with a lip is perfect to prevent them sliding off as you carry the tray! Place them so that they touch, as the mix has a tendency to drip and any excess will fall into the next patty pan. Once the chocolate is completely melted & uniform in colour, remove from the heat, and add in the dry ingredients. Using a heat proof spatula or flat metal serving spoon, combine the mixture by repeatedly sliding the spoon down the edge of the bowl under the mix, and then drawing towards the center, turning the bowl as you go. This sliding motion prevents you from crushing the rice bubbles, preserving the 'crackle'! Continue until all the dry ingredients are coated in chocolate. Take two spoons to distribute the mix - a dessert & teaspoon, or two teaspoons, depending on the size of your patty pans. Scoop some mix onto the spoon in your favoured hand, and use the second (smaller) spoon to scrape it into the patty pan. You might also need to use the second spoon to occasionally scrape clean the base of the main spoon to avoid excess drips. Fill the pans in two passes so that you get an even distribution. It also allows the mix to settle into the pans, so you can fit more in! Once all the pans are full - add more pans if you need to - place the tray into the fridge for about 30-60 mins, or until set - depending on your fridge. Remove from fridge about 5 mins before serving. This lamb! Prepare to swoon. I love an easy roast that I can pop in the oven and forget about for hours. This lamb shoulder is the perfect candidate – it loves being left alone all day to become melting tender, so tender that you can pull it apart with a fork. I’m always looking for ways to tie different elements of a dish together. With this recipe, we steal some of the juices from the lamb and massage them into the rice. It’s a little bit naughty but oh so very nice. We also use sumac, a dried berry spice, in two ways: it’s part of the the Middle-Eastern lamb rub and it’s tossed through the rice, lending its lemony brightness to both. If you don’t have sumac, don’t worry! The lemon in both parts of the recipe will take care of the bright citrus notes. You could even squeeze a little extra lemon juice over the dish just before serving. This recipe uses a Thermomix. 1. Preheat oven to 200°C (390°F). Place pepper, coriander, cumin, fenugreek, and salt in mixing bowl and chop 20 sec/speed 9. 2. Add garlic and preserved lemon and chop 5 sec/speed 5. 3. Add sumac and olive oil and stir 10 sec/speed 3. 4. Make small cuts in lamb and rub marinade into lamb shoulder on both sides. Place lemon slices in base of roasting dish and put lamb shoulder on top. Add 1 cup water, cover with foil and place in oven. Turn oven down to 160°C (320°F) and cook 2 hours. 5. Pour off 1/2 cup lamb juices and reserve. Add 1 cup water to the roasting dish and cook for a further 2 hours, covered with foil. 6. Soak figs in water for at least 30 minutes, then drain them and roughly tear them. 7. Add figs to roasting dish, remove the foil to crisp the top a little bit, and turn oven up to 180°C (350°F). Roast for a further 30 minutes while cooking the rice. Lamb is ready when it can be pulled apart with a fork. If lamb is ready before rice is cooked, turn oven off, cover roasting dish with foil and let it sit. 8. Place water in mixing bowl and rice in steamer basket. Wash rice 10 sec/speed 5. 9. Pour lamb juices over rice. Cook 20 min/Varoma/speed 4. 10. When rice is cooked, remove from steamer basket to a bowl and toss with chopped mint, parsley, lemon zest, sumac and salt, to taste. To serve, transfer lamb and figs to a platter and serve with rice. It’s okay to use a lamb shoulder with bone in or deboned. The oven times are a good guideline but you’ll know the lamb is ready when it can be pulled apart with a fork. If you don’t have sumac, squeeze a little lemon juice over the lamb and rice before serving. Sumac is a dried berry that’s crushed to create a tangy spice. You can find it in some supermarkets, nut shops and wholefood stores. This recipe and the accompanying how-to video is live at danivalent.com, along with 150 other fantastic Thermomix recipes. Become a member to have access to all this, plus great new content every week. For me, working full time but wanting to remain as healthy and focused as I can all comes down to the way I nourish my body through food. Food is my main source of joy, in every sense of the word. However, I can’t be my happiest unless I am feeling my healthiest. That’s why I love this simple dish of brown rice, wild mushrooms and hazelnuts. I guess a perk of being a chef is being able to “throw together” meals that just happen to turn out. That’s how this one came about. It’s balanced - including greens, seeds, nuts and whole grains. It’s easy to make, it’s inexpensive and it really is quick once you’ve made it once or twice! My favourite thing however, is how easy it is to share. My friends and family often think I’m crazy for being so “healthy” and vegan all the time. I love feeding them meals like this to show them how tasty healthy food can be! While the nuts are roasting, boil your rice and quinoa in separate pots. A rice cooker is the fool proof plan for the brown rice and my go-to for quinoa is nine minutes in boiling water and then strained. To make the hazelnut crumb, blitz the roasted hazelnuts and the picked thyme in a food processor until powdered but chunky. Remove from the food processor and stir through the black sesame, and salt and pepper to taste. This crumb will store air-tight in the cupboard for weeks and makes a great topper for salads and pasta if you wanted to make extra or don’t use it all up! For the hummus, in a food processor place the drained chickpeas, tahini, ground cumin, garlic, lemon juice, olive oil and salt and pepper. Blitz on high until a smooth consistency is achieved. For the brown rice, quinoa and wild mushrooms, gently tear up the oyster and enoki mushrooms and cut the button mushrooms into quarters. Heat up a large pan to medium/high heat with some olive oil. Once the pan is nice and hot, throw in the mushrooms, some salt and some pepper. Saute these until they are golden. (Mushrooms throw out a lot of water, so try not to stir them when you first put them in will allow more colour to occur.) Once golden, remove the mushrooms and sit them aside. Re-heat the pan again with olive oil and throw in the kale. The kale should pop and sizzle when it hits the pan. Next in is the rice and quinoa you cooked earlier. Season again with salt and pepper and mix it around until its evenly distributed and coated lightly in oil. I like to plate this one up individually. To serve , cover the bottom of a bowl with a thin layer of hummus, followed by generous serve of the rice and kale mixture. I then place the wild mushrooms on top followed by a snow pea tendrils, lightly dressed in olive oil. Then a nice helping of the hazelnut crumb and some red vein sorrel to garnish. Green rice is an early autumn delicacy said to have originated half a century ago in Vong village, close to Hanoi. The village experienced severe flooding and the villagers were forced to harvest their rice early. The hungry farmers decided to make the most of the situation. They roasted the grains, then repeatedly pounded them using a mortar and pestle to remove the husks and in the end found that they had accidentally stumbled on a delicious treat. Green rice can be used to enhance dishes like this one, where it adds a subtle, nutty flavour. It is also a special snack in its own right, being sold in neat parcels wrapped in mildly fragrant lotus leaves and often eaten with banana. Soak the glutinous rice in cold water for 8 hours or overnight. Drain the rice and rinse it under cold running water until the water runs clear. Sprinkle the rice with the salt, place it in a steamer lined with muslin cloth and steam for 30 minutes. Meanwhile, cook the lotus seeds in boiling water for 20 minutes, then drain. Soak the dried mushrooms in water for 20 minutes. Drain the mushrooms and squeeze out any excess water. Remove the stems and chop the caps. Break the pandan leaves into small pieces, place it in a mortar and pound with a pestle. Wearing a kitchen glove, squeeze the leaves to extract the juice. Discard the leaves. Heat the chicken fat or oil in a frying pan and fry the shallots until soft. Add the sausage and cook for 1 minute. Add the lotus seeds, mushrooms, fish sauce and pepper and cook for a further 2 minutes. Soak the lotus leaves in warm water for 3 minutes, or until softened. Place the steamed rice in a large bowl. Add the lotus seed mixture, along with the remaining ingredients. Divide the rice into two portions. Lay a lotus leaf, vein-side down, in a deep bowl. Place one portion of the rice in the centre of the leaf and lightly press down. 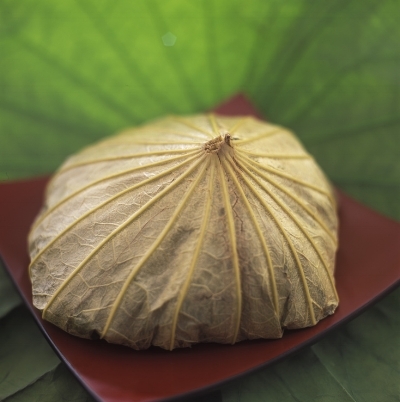 Fold the lotus leaf sides over the rice and place a saucer on top. Turn the lotus leaf parcel over so the parcel is sitting on the saucer. Remove the bowl. The weight of the rice will help keep the leaf in place. Repeat with the remaining lotus leaf and rice. Place the parcels on a steaming rack over rapidly boiling water, cover and steam for 25 - 30 minutes. Remove from the heat and cut open the parcels, being careful not to burn yourself on the steam. Many say that the mark of a really good pasticceria is their budini di riso, a classic breakfast item amongst the line-up at any pastry shop. It’s not that they are difficult to do. Actually, they are really quite easy. I believe it’s more about the care put into them and the balance of sweetness, as it’s so disappointing to get a sickly-sweet budino di riso. The short pastry case should be thin, ever so slightly sweet and on the soft, blonde side. The rice pudding should be moist but firm, not hard and not too sweet, as the pretty, powdery icing sugar that coats the top supplies enough sweetness. To make these, you really only need the classic sweet pastry recipe used for crostata and the recipe for rice fritters minus the flour and baking powder. Simple. To get the right shape, it’s ideal to have a friand pan or deep, oval pastry cups. Failing that, you can simply use a regular muffin tin. To make the Sweet Shortcrust Pastry, chop the cold butter into small pieces. If using a food processor, pulse the flour, sugar and butter until you have a crumbly, sandy texture and there are no more visible pieces of butter. If mixing by hand, rub the butter into the flour and sugar Ωuntil you achieve the desired result. Mix in the beaten egg and yolk along with the lemon zest, until the pastry comes together into a smooth, elastic ball. Wrap tightly in plastic wrap and rest in the fridge for at least 30 minutes. To make the rice filling, place the rice and milk in a saucepan over low–medium heat, and cook, stirring frequently until the rice is soft and the mixture is thick and creamy, about 20 minutes (keep a careful eye on it that it doesn’t overflow or burn). Take off the heat, add the butter, and let it cool slightly before adding the eggs, sugar, salt, the lemon and orange zest and vanilla. Leave to cool completely. After resting the pastry dough, place on a lightly floured work surface, and roll out the pastry to a thin 2–3 mm sheet. Cut out rounds and press into eight oval pastry cups or an eight-hole friand pan, leaving a few millimetres of pastry overlapping the lip of the cup. Fill with the cooled rice filling. Bake the budini for about 30 minutes or until light golden and firm. Let them cool a little in the pan before removing to a wire rack to cool completely. Dust with icing sugar before serving. These are best eaten the day they are made (possibly warm) but you can store them in an airtight container in the refrigerator for a couple of days. Photography by Patricia Niven. Styling by Caroline Velik. With its gorgeous mix of salty and sweet, this is one of those great recipes that takes no time to cook and gets devoured by the family. It’s great served as it is, though if you want you could always top it with some sliced chillies, fresh herbs, crunchy toasted nuts or even a fried egg. The eggplant here can also be replaced with other stir-fried vege in season like zucchini, cabbage or green beans. Put the pork, eggplant, kecap manis and soy sauce in a bowl, and mix together with a fork. Cover with a plate, transfer to the fridge and leave to marinate for 2–3 hours (removing from the fridge 20 minutes prior to cooking to take the chill off). Add the rice and 500 ml (2 cups) water to a saucepan over a high heat, cover with a lid and bring to the boil. Once boiling, remove the lid and stir, then reduce the heat to a very low simmer and cook, covered, for 10 minutes. Remove from the heat and leave to sit, still covered, for 10 minutes. Heat the olive oil in a large frying pan or wok, add the marinated pork mixture and sauté for 10 minutes, using a wooden spoon to break up the minced pork into small pieces as you go, until the pork is cooked through and the eggplant is soft. Add the cooked rice and orange juice and toss everything together. Serve. This recipe is an extract from the book published by Hardie Grant, photography by Patricia Niven and styling by Caroline Velik. Combine the first seven ingredients while the rice is still warm. Then add the rest of the ingredients once the rice is cool. Allow to stand for at least 30 minutes to let the flavours develop. Transfer to a serving platter. Sprinkle with chopped pecans, herbs and flowers. Combine the sweet potato, onion and olive oil on a baking tray and season with salt and pepper. Bake for about 20-30 minutes or until tender and golden brown. Meanwhile, cook the rice according to packet instructions. In a frypan over high heat, heat a drizzle of olive oil before adding the chicken. Sprinkle with the paprika and cook, tossing, until golden brown and cooked through. Set aside. To make the dressing, combine the garlic, soy sauce, peanut butter, honey, lime juice. Whisk in enough olive oil to reach your desired consistency (I like it thick but pourable). To serve, place rice in the bottom of bowls and top with spinach. Place chicken, sweet potato and sliced avocado next to each other on top. Drizzle with dressing and garnish with coriander.